Mined from the recesses of the Marvel Comics catalogue, Big Hero 6 is the first Walt Disney Animation adaptation since Disney acquired Marvel Entertainment five years ago. The relative anonymity of the source material allows writer-directors Don Hall (Winnie the Pooh) and Chris Williams (Bolt) the creative license to fashion a film free of fanboy preconceptions and expectations. Let’s ponder for a moment what could have been: another Marvel movie about a team of mutant superheroes the vein of The Avengers, X-Men, and Guardians of the Galaxy, except this time for the kids. Instead, Disney retools the property into not just a riff on the superhero origin story, but also a movie with genuine wit, warmth, energy and sentimentality. The result is one of the best animated films this year (only The Lego Movie is its rival at the moment). At the urging of his older brother Tadashi (voiced by Daniel Henney), 14-year-old prodigy Hiro Hamada (Ryan Potter) abandons nights spent hustling underground robot fights to seek enrollment at the Institute of Technology in San Fransokyo, a visual portmanteau of San Francisco and Tokyo. Indeed, the film’s overarching construct is a knowing amalgam of eastern animation stylings and western storytelling sensibilities. Hiro earns admission by creating billions of shape-shifting nanobots, all controlled telepathically by their user and capable of adopting an endless array of uses and formations. Hiro spurns an offer to sell his nanobots to a tech conglomerate headed by entrepreneur Alistair Krei (Alan Tudyk). Shortly thereafter, a fire engulfs the institute with Tadashi and Prof. Robert Callaghan (James Cromwell), the institute’s head of robotics and Tadashi’s mentor, still inside. Hiro vows revenge on the masked villain who killed his brother, and he recruits Tadashi’s whiz kid classmates to help. Using their scientific ingenuity, GoGo (Jamie Chung) affixes electromagnetic wheels to her ankles to move about at blazing speed, neatnik Wasabi (Damon Wayans Jr.) fashions a pair of laser blades to his arms, Honey Lemon (Genesis Rodriguez) is a quirky whiz whose purse doubles as a chemistry set, and Fred (T.J. Miller) is a laid-back rich kid (see: the wealthy alter ego trope) who dons a Kaiju suit that blasts real fire. Yet the film’s heart and soul is Baymax (Scott Adist), a portly, inflatable robot constructed by Tadashi and, thanks to Baymax’s SIM chip, Hiro’s last link to his departed brother. Programmed with a quiet manner and childlike innocence, Baymax is designed as a prototype personal healthcare companion. 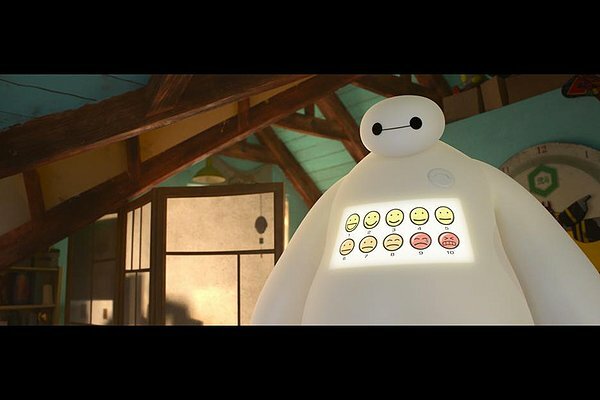 “Are you satisfied with your care?” Baymax asks at the conclusion of each treatment, and the request takes on deeper emotional meaning throughout the film. Baymax’s pliable interpretation of his healthcare imperative compels him to assist Hiro in his search for justice. In furtherance of that, Hiro programs Baymax to master a variety of martial arts and covers his Stay-Puft-Marshmallow exterior with more durable armour. But all these accoutrements cannot mask Baymax’s innate humanity. In a film blessed with photo-realistic animation, fashioning such a visually pared-down central character is radical unto itself. And amusing. While Hiro and pals get their share of wisecracks, it's Baymax who produces the biggest laughs. A scene where Baymax uses Scotch tape from a police sergeant's dispenser to plug leaks in his latex-like dermis is classic absurdist humor, as is his low battery mood being akin to intoxication. And the robot's computerized approximation of a fist-bump is what your kids will be repeating days later. Among the provocative themes in Big Hero 6 is the fine line between justice and vengeance plus society’s temptation to misuse our technological advances. Even more gratifying is casting education and gifted youngsters as heroic. But at the film’s core is a study of grief and maturation, all through the prism of a young boy and his robotic companion. Equipped with soaring, eye-popping visuals, Big Hero 6 will both have your heart pounding and put a lump in your throat.